In common practice, the issue with the simplification of Japanese/Chinese characters is mostly brushed aside as like “taken note of” but it is not that easy, at least not for me as translator. Many people interested in the Japanese sword are aware of the fact that a simplification of characters exist and that older characters with (too) many strokes were at a certain point in time simplified by removing some strokes. The simplification itself is not the main topic of this article as I want to focus more on my problem as translator with dealing with them, but I nevertheless want to start with a general overview of the whole subject of simplification of Japanese/Chinese characters. In postwar Japan, i.e. in 1946, the Japanese Ministry of Education issued the so-called “list of kanji for general use” (tôyô-kanji-hyô, 当用漢字), a reform of the Chinese characters so far in use in Japanese written language. This was an official thing like the various spelling reforms of the English language which means schools, governmental documents, newspapers and the like had to follow the tôyô-kanji-hyô. The initial list contained 1.850 characters, some of them simplified. The simplification process was basically done in two ways: Either the right-hand radical which indicates the on´yomi (Sino-Japanese reading) was replaced with another character of the same on´yomi with fewer strokes, or an entire complex compound of a character was replaced by a simpler one. But the simplified characters were no complete new creations as many were based on widely used handwritten abbreviations (ryakuji, 略字) of the prewar era. For example the character for hiro(i) (廣, expansive, wide) was replaced by the character (広) but which was already “unofficially” in use in earlier times to abbreviate the relativ large number of strokes. But there was also another way of simplification, namely by orientating on the on´yomi. For example for the old character i (圍, enclose), the inner part (韋) – which determines the on´yomi – was replaced by the radical (井) which doesn´t mean the same as (韋) but which also reads i. So i (圍) became (囲). In 1981, the tôyô-kanji list was replaced by the Ministry of Education by the jôyô-kanji (常用漢字) which are known to everybody who learns Japanese. The initially 1.850 tôyô characters were extended by 95 which in turn were just recently once more extended by 196 in 2010 (also five characters were removed). So far, so good. The “problem” now is that we mostly dealing with more or less ancient texts and inscriptions and they require a certain sensibility. At the beginning I was talking of common practice and this common practice is to use by default the simplified version of characters. Most of the recent publications, or at least those published since the 1970s, handle it this way. That means, a signature like “Sagami no Kuni Hiromitsu” chiselled with the characters (相模國廣光) is usually quoted as (相模国広光). 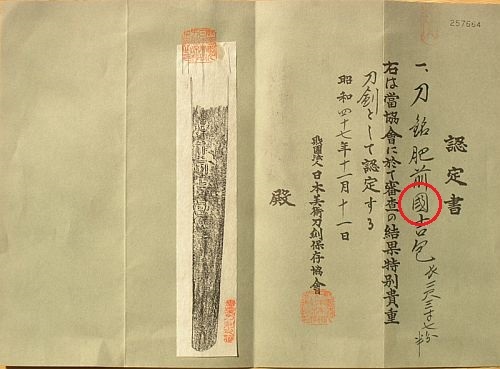 Also the NBTHK uses the simplified characters when issuing papers even if the blade itself is signed with old unsimplified characters (see picture 1). However, we occasionally also find old kichô papers which make use of the old characters (see picture 2). Picture 1: tokubetsu-hozon paper for a Sukehiro which quotes the characters (助広) although the blade is signed (助廣). Picture 2: tokubetsu-kichô paper from 1972 which quotes the character for “Kuni” (国) in the old way (國). So is there a “correct” way to deal with these simplifications in translations? Basically yes, because strictly speaking, we must follow the spelling reform. But as we find ourselves in the field of antiques, we are quasi somewhat “special”. That means in a “totally correct” way, the original inscription/signature should be reproduced with the very same characters it shows and it might be extended by a simplified circumscription in parenthesis or as footnote. This is fine for a native reader for whim the thing is more or less clear. He knows that he is facing simplified characters when reading a paper or a book which mentions signatures for examples. Also (of course depending on the experience and depth of study) he basically knows the unsimplified version of the characters and knows thus how the blade is actually signed. 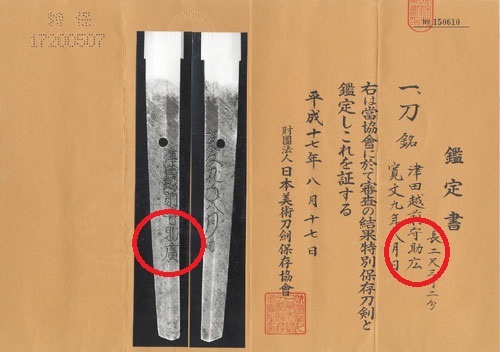 So if a native reader reads in a book a line with a reference to the signature “Sagami no Kuni Hiromitsu” (相模国広光), he knows that the blade, as being several hundred years old, should show the characters (相模國廣光). By the way, there are of course exceptions where even medieval craftsmen made use of simplified characters. For a Western reader or collector however, the thing is far more difficult as he might be unable to associate an unsimplified signature with the quote in a publication. Because of that, I am frequently addressed that my translation does not match the signature they have or that I made a mistake. So we are back at what is the best way to handle this issue. Mostly it is namely impractical to add comments or footnotes to each and every quote/translation. Also rather impractical is to add a note to every translation like “be aware of the fact of the simplification of characters”. Well, I did point out the use of simplifaction or rather the presence of unsimplified characters in my previously published Kantei volumes for example to avoid confusion as the presented oshigata right next to the translation shows clearly the old characters. For the future, I must admit that I will follow the spelling reform and use the simpified characters, and that I will point out potentially confusing situations with unsimplified and simplified characters separately.